This image was compiled from figures from the National Centre for Immunisation Research and Surveillance (NCIRS) by Cosmos Magazine. It gives a good visual overview of the places where vaccination uptake levels are low and hence the likelihood of diseases spreading once they get into the population is high. 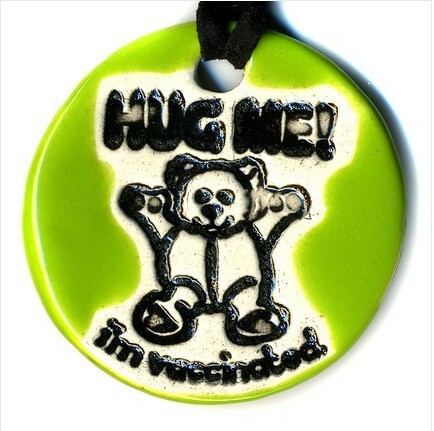 The term given to protection from disease outbreak when a large percentage of the population is vaccinated is “herd immunity”. In simple terms, it means those who are not vaccinated because they are either too young or may have allergies or be immunocompromised, are protected by other people. The concept of “herd immunity” as a mechanism for protecting others is often rejected by anti-vaxers, perhaps because they won’t acknowledge they are putting other people’s kids at risk by choosing not to vaccinate. For an easy to understand explanation of how herd immunity works check out the video on the website Chain Of Protection. It’s a stark reminder in light of another death from pertussis this week, this time of a 5 week old baby boy in Adelaide – the first since 2001. South Australia has been experiencing a pertussis epidemic for over 12 months now. According to statistics from the SA Department of Health, during the period of 1 January 2010 to 15 June 2010, a total of 2,277 cases were reported, compared to 1,493 cases reported for the same period last year. Being so young, the boy was too young to be vaccinated and may have caught the bacteria from an adult carrying the disease. Many adults and parents are not aware that their whooping cough vaccine does not last forever and as such, they may need to get a booster shot – especially if they are caring for young children. Some governments offer free booster shots, but the SA government is still considering had lagged behind in this respect. A story from Adelaide Now reports that SA Health chief medical officer Professor Paddy Phillips said the department was waiting for the release of a report into whooping cough vaccinations. “There’s a Federal Government working party looking into the issue of subsidy for a whooping cough vaccine for adults … when that party reports, we will take up their recommendations,” he said. The party has been working for a long time it would seem. The McCafferys met with both federal and state governments over a year ago, following the death of their daughter from pertussis, to ask them to instigate an education campaign. Let’s not beat around the bush, while departments pass the buck & blame, kids are dying. For the Adelaide boy’s parents, vaccination was not an option, but some parents are choosing not to vaccinate. Part of the reason for this trend is the amount of misinformation on the internet – and many people rely on “Google University” to get information these days. 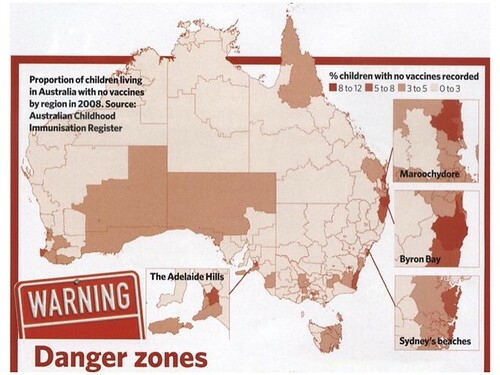 The two lowest areas for vaccine coverage in Australia are the Northern Rivers Region (covering the Byron Bay area and the AVN) and the Eastern Suburbs of Sydney, demographically two very different areas. One is characterised by alternative lifestyle families (one could say hippies) and the other well educated, affluent white collar workers. Whilst the reason the former choose to not vaccinate is probably clear, the other is not. Whatever the reason, vaccination has been a victim of it’s own success in many ways, as people become complacent about the threat of communicable disease. We don’t see kids in calipers or iron lungs these days, so out of mind out of sight. Yet, there is plenty of accurate information on the internet for concerned parents if you look in the right places. 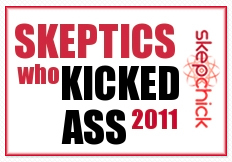 I wrote this article for the launch of the new Australian Skeptics website over 12 months ago but it still serves as a good resource for links to government websites and other accurate information. One example of bad advice, is that offered by homeopaths who are allegedly recommending “unproven” herbal remedies, including belladonna and phosphorus, for whooping cough. According to an article on Adelaide Today, homeopaths say their treatments can prevent and cure whooping cough, while doctors say that is “complete rubbish”. The newspaper contacted the Australian Homeopaths Association for comment but did not receive a response. For the uninitiated, homeopathy is water which contains no active ingredients at all, so of course it can’t cure or treat any disease. Well, apart from dehydration of that is. Yes well, citation needed. Actually none of that is accurate. Meanwhile, the ninth infant has died from pertussis in California in an epidemic about to break records. 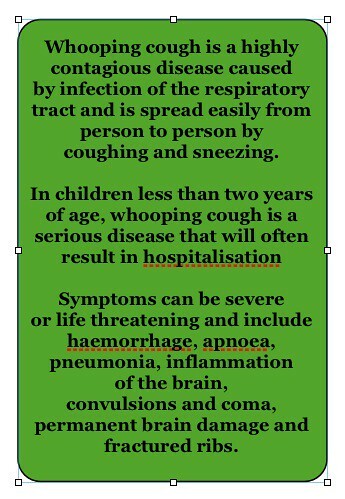 And the education campaign about the dangers of pertussis promised by the Australian government has not materialised. This is a preventable tragedy and one that needs action now. « Things your doctor doesn’t want you to know!1!!! But apparently North Korea does.